Intel Corporation was founded on July 18, 1968, by semiconductor pioneers Robert Noyce and Gordon Moore, and widely associated with the executive leadership and vision of Andrew Grove. The company's name was conceived as portmanteau of the words integrated and electronics. The fact that "intel" is the term for intelligence information also made the name appropriate. Intel was an early developer of SRAM and DRAM memory chips, which represented the majority of its business until 1981. Although Intel created the world's first commercial microprocessor chip in 1971, it was not until the success of the personal computer (PC) that this became its primary business. During the 1990s, Intel invested heavily in new microprocessor designs fostering the rapid growth of the computer industry. 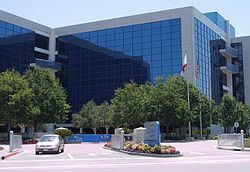 During this period Intel became the dominant supplier of microprocessors for PCs and was known for aggressive and anti-competitive tactics in defense of its market position, particularly against Advanced Micro Devices (AMD), as well as a struggle with Microsoft for control over the direction of the PC industry. Intel was placed at #56 on the 2015 rankings of the world's most valuable brands published by Millward Brown Optimor. The Open Source Technology Center at Intel hosts PowerTOP and LatencyTOP, and supports other open-source projects such as Wayland, Intel Array Building Blocks, and Threading Building Blocks (TBB), and Xen.